Asserting Punitive Damages (or Appealing the Decision to Allow for Punitive Damages) - В сложной финансовой ситуации приходит на помощь кредит наличными в Казахстане. (1) In any civil action, no claim for punitive damages shall be permitted unless there is a reasonable showing by evidence in the record or proffered by the claimant which would provide a reasonable basis for recovery of such damages. The claimant may move to amend her or his complaint to assert a claim for punitive damages as allowed by the rules of civil procedure. The rules of civil procedure shall be liberally construed so as to allow the claimant discovery of evidence which appears reasonably calculated to lead to admissible evidence on the issue of punitive damages. No discovery of financial worth shall proceed until after the pleading concerning punitive damages is permitted. (a) “Intentional misconduct” means that the defendant had actual knowledge of the wrongfulness of the conduct and the high probability that injury or damage to the claimant would result and, despite that knowledge, intentionally pursued that course of conduct, resulting in injury or damage. (b) “Gross negligence” means that the defendant’s conduct was so reckless or wanting in care that it constituted a conscious disregard or indifference to the life, safety, or rights of persons exposed to such conduct. It is NOT appropriate to merely plead punitive damages in your initial lawsuit and think by virtue of this allegation that you will be able to argue punitive damages to the jury. That would not be fair, would it? This would simply allow a party in every civil lawsuit to argue punitive damages to the jury. Rather, and as you can see from the statute, you must reasonably show by proffering evidence to the trial court that you have a reasonable basis to the recovery of such damages. But, you are able to take discovery relating to evidence you want to proffer associated with punitive damages (assuming the discovery is reasonable). And, presuming the trial court allows you to argue punitive damages to the jury, a defendant should only be liable for punitive damages based on clear and convincing evidence that the defendant was guilty of intentional misconduct or gross negligence, as defined in the statute. The statute provides standards in order for a party to pursue and argue punitive damages to the jury. What do you do if you are a defendant and the trial court grants the plaintiff’s motion for leave to include a punitive damages component? 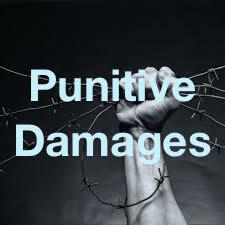 Punitive damages are a damages-component you do NOT want argued to the jury. “Certiorari review is available to determine whether a trial court has complied with the procedural requirements of section 768.72, but not to review the sufficiency of the [proffered] evidence.” HCA Health Services of Florida, Inc. d/b/a St. Lucie Medical Center v. Byers-McPheeters, 2016 WL 3549595, *1 (Fla. 4th DCA 2016). Stated differently, you can seek a writ of certiorari arguing the trial court failed to properly comply with s. 768.72, but not to review the evidence proffered to the trial court relating to the trial court’s decision to allow a punitive damages component.